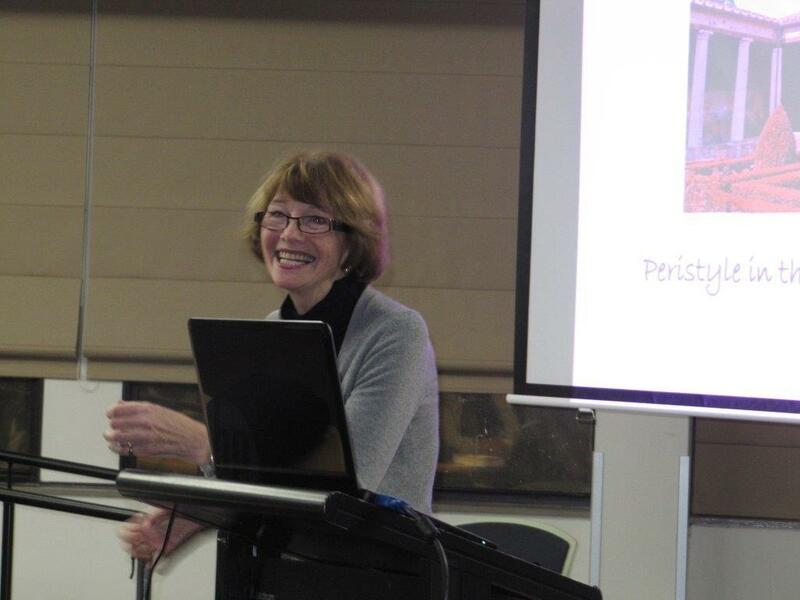 The guest speaker at our cultural event on 16 July 2015 was Emeritus Professor Elizabeth Minchin of the ANU’s Centre for Classical Studies. She gave a fascinating presentation on the domestic gardens of the ancient Romans, focusing on the area around Mt Vesuvius in the decades before it erupted in 79 AD. From the earliest years of the ancient Roman civilisation, Prof Minchin told us, small farmhouses had their own hortus – a herb and vegetable plot and/or orchard. Even in the city of Rome itself, apartment dwellers had gardens in the form of window boxes for herbs and vegetables. The tradition was maintained in Pompeii’s earliest homes, which had a hortus at the back of the house. This was a private, interior space, included within the walls which surrounded the whole block of land on which the house was built. Then, from the 2nd century BC, influenced by Greek practice, Roman houses began to include a colonnaded courtyard – a peristyle. The Romans used it to bring light into the house, with a direct sightline into the atrium. Whereas in the Greek world, courtyards were plain and unembellished, the Romans filled their peristyles with plants and garden ornaments. Greek stonemasons were kept busy producing statues for peristyle gardens – wonderful works of art for the rich, while large numbers of cheaper copies and adaptations were produced for the mass market. In the late 1st century BC or early 1st century AD, following the construction of an aqueduct from Mt Vesuvius, gardens in Pompeii began to be planned around a water feature, such as a fountain or pool. Examination of the surviving lead pipes shows that the aqueduct water went principally to the garden, well-water being used within the house. The ready availability of water also affected the choice of plants. Previously, gardens contained mostly trees and ivy that search for water themselves, but with the advent of the aqueduct, low ornamental plants began to be planted, to frame a view or lead the eye to a water feature – box hedges, myrtle, plane trees, acanthus, cypress and rosemary. Greenery predominated over flowers. But the Romans did not abandon the idea of the practical, productive garden. Many houses had a hortus behind the peristyle and some peristyle gardens contained fruit trees. So how do we know what was planted in these gardens 2000 years ago? 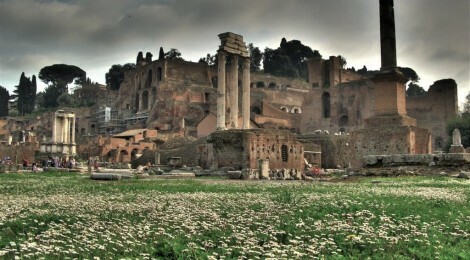 Until recently, Prof Minchin told us, the only sources of information about Roman gardens were descriptions in the letters of Pliny the Younger, the stunning wall paintings preserved at Pompeii and Herculaneum, and observations of the remains of 450 or so houses in Pompeii which had had gardens. These sources had their limitations. Pliny was writing about the huge gardens attached to his country villas, rather than small domestic town gardens. The wall paintings show not real, but ideal, gardens. And although many ancient buildings survived in Pompeii and Herculaneum for us to see today, the 1st century garden plants of course did not. However, valuable new evidence has been provided in the last 40 years by the American archeologist, Wilhemina Jashemski (1910-2007), particularly in her two volume book – The Gardens of Pompeii, Herculaneum and the Villas Destroyed by Vesuvius. Prof Jashemski was the first person to undertake the systematic excavation and study of those gardens. In Pompeii, of 1800 houses, 450 had gardens, but many were looted or destructively excavated. Prof Jashemski found eight that were relatively untouched. To find out what was planted in each, she used identification of root systems, debris and pollen. Her method for establishing what plants had been in a garden by examining ancient roots is particularly interesting. After the plants died following the eruption of Vesuvius, as the roots decayed, volcanic debris (“lapilli”) gradually filled the cavities, so the form of the roots was preserved by the filling of volcanic material. Prof Jashemski cleared the lapilli to the 79 AD level and could see where the ancient roots began. She carefully removed the lapilli from the cavities, reinforced the cavities with wire and then filled them with plaster or cement. This gave a cast with the shape of the ancient root, which could be identified by botanical specialists. The first garden to which she applied this methodology was at the House of Julius Polybius in Pompeii. There was a peristyle measuring 10 m by 10 m. She took root casts and also had the carbonised wood, seeds, nuts and fruit analysed. She concluded that at the time of the eruption of Mt Vesuvius, the peristyle garden contained two fig trees that were 30 to 35 years old, two cherry/pear/apple trees, and one olive tree. All were productive. In fact, Prof Jashemski found near them the carbonised wood of what may well have been a ladder that was abandoned in the garden when Mt Vesuvius erupted at harvest time. The fruit trees were pruned high enough to allow plantings under them, at least round the edges. She also found evidence of citrus trees espaliered against the garden wall. There was a small amount of purely ornamental planting. The descriptions that Pliny the Younger left of his large villa gardens had given later readers the idea that ancient gardens were all formal and symmetrical. However, Prof Jashemski’s work transformed our understanding. Only one of the domestic gardens she examined had a formal, symmetrical arrangement. Generally, the Pompeiian peristyle was planted informally with evergreens and herbs, with a few flowers to lend colour, and in five of the eight gardens she studied there were trees, even though the gardens were small. The garden was a place for socialising, for private meetings, for contemplation and for eating outdoors. Women wove in the colonnades (where loom weights have been found). There is evidence of pets – dogs and tortoises. The garden also provided a peaceful scene that could be viewed from indoors. A garden was a source of interest and pride for the householder. If a house was short of space, it would contain a miniature garden or there would be a wall painting of a garden in the atrium. It was important to the Romans of the 1st century AD to have one’s own garden or the illusion of a garden. Prof Minchin concluded that, though we tend to think of the ancient Romans in the context of war, gladiatorial contests and ruthless conquest, there is another side to them. We should also think of the Romans at home with their window boxes and their houses built around green, leafy gardens.